Under Rajkumar Hirani's light touch and unwavering optimism, the darkness of Sanjay Dutt's life acquires the spirit of a sportsman, grit of a soldier, humour of a rascal and regrets of a son, notes Sukanya Verma. My earliest memory of Sanjay Dutt is as an eight-year-old crushing on a dungaree-clad lanky boy awkwardly moving his lips to Kya yehi pyaar hai. His lost Alice air, droopy eyes and kooky smile had an odd appeal on a screen dominated by artists and aplomb. My second impression formed few years later when mom interviewed a long-haired, muscle-rippling stardom-seasoned Dutt on the sets of some long-in-the-making drivel where he freely spoke about his drug addiction, mother's tragic loss, bumpy career and screen idols. I went through the tape over and over again till I knew every single word he spoke by heart. Such honesty was inspiring to me. When I finally met him on the sets of Kurukshetra in 2000, he had already done time in jail under the Terrorist and Disruptive Activities (Prevention) and the Arms Act linked to the 1993 Mumbai serial blasts. The Dutt I came across was nothing like I had imagined and barking expletives left, right and centre. As disappointing and bubble-bursting the experience was for a rookie journalist, I didn't want to confuse his irritation over a delayed shooting schedule as the hostility of a problem celebrity. Ultimately, the Sanjay Dutt I know, don't know and hoped for are all a product of perception, hearsay and fleeting interaction. No judgment can be completely true or final. The Bollywood actor's biopic by Rajkumar Hirani doesn't share my ambiguity and tackles the Sanju myth with his inimitable, wholehearted idealism. Whether or not his selective portrayal of Dutt's countless controversies and crisis convinces us of his subject's innocence it does say a lot about the film-maker's beautiful, believing, if slightly biased soul. Tears, cheers and a brilliant, Sanj, er, Ranbir Kapoor make this lopsided biopic a fascinating study of fact versus fiction where media's enthusiasm for racy speculation is an outright villain while the eternally crucified Dutt shows little signs of remorse. Hirani decided to work on the biopic after hearing Sanjay Dutt's side of the story and his sympathy reflects in every frame. Many would scoff at a star son's propensity for making a mess out of a perfectly charmed, cushioned life and throwing away his celebrated parents' goodwill to get out of hot water every single time. Hirani, on the other hand, patiently tries to understand and explain the burdens and insecurities of an individual weighed down by the talent and virtue of his legacy. Sanju is how memories become stories the size of myths. The rest is all interpretation. Under Hirani's light touch and unwavering optimism, the darkness of Dutt's life filled with too many misdemeanours to be overlooked as miscalculation, acquires the spirit of a sportsman, grit of a soldier, humour of a rascal and regrets of a son. Even where Hirani acknowledges Dutt's transgressions, the tone of his disapproval is akin to that of a father's admonishing his child for effect in public whilst secretly absolving him of all mischief. One can expect the suffering to be just as pronounced with exaggerated moments of humiliation and potty-floating spectacle. Despite this leniency, Sanju never comes across as sober or saint. The reality of his notoriously eventful existence coloured by death of family members, rehabs, strip clubs, LSD stupors, wobbly stardom, womanising ways, run-in with law, underworld, prison and terrorist tag is much too contentious to afford such liberty. And that's when its 161 minutes of running time skips all his numerous affairs, marriages, divorces and strained ties with sisters to purely focus on Dutt's journey from addict to convict to survivor. Although for someone claiming to have slept with over 350 women, Sanju's romantic chapters are rather cursory. Truth be told, the women don't have much to do. Manisha Koirala reveals a little bit of Nargis the star, but it's the ailing mother we feel for. Dia Mirza's Maanayata stays in the sidelines as the supportive significant other. Sonam Kapoor's sadness and screeching for the 'bloody mangalsutra' is surprisingly effective in context of a disturbingly dramatic scene. Anushka Sharma appears as a curly-haired embodiment of Hirani's ethics and empathy. Karishma Tanna's not-what-you-are-thinking bit winks and disappears. Among the men, Paresh Rawal's puttar-cheeping warmth never quite fits into the benign and graceful imagery of Sunil Dutt but his restraint ensures it's doesn't get jarring either. Jim Sarbh is wicked good as the smooth-talking fiend responsible for Dutt's drug problem while Vicky Kaushal steals the scene where he's explaining his best friend's ordinary guy limitations to his extraordinary daddy. Hirani regular Boman Irani pops up to play the sort of caricature he'd deliver in his sleep. Speaking of sleep, Anjan Shrivastav's snoozing cameo is a hoot and instant classic. If only Hirani would resist drowning his characters in Gujarati/Parsi stereotype overkill. There's a bit of self-patting too what with a gloating mention of Munnabhai MBBS slipped in every now happily ignoring Vaastav's glory precedes the Jadoo Ki Jhappi phenomenon. 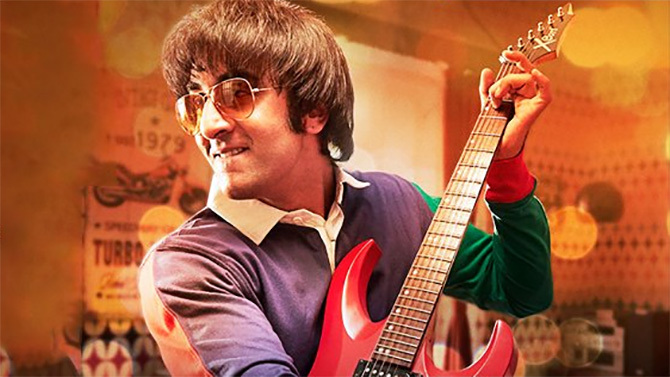 But even at its most obvious, overdone and withholding, Sanju is effortlessly compelling. The reason is Ranbir Kapoor. He is two performances, two people in one body and it's incredibly satisfying to watch him grow and decline in sync with the script's zigzag timeline revealing the murky magnetism of a wild rebel, entitled brat, presumptuous fool, promiscuous cad and serious offender consumed by a damaging lifestyle and affinity for dangerous company. Ranbir covers a wide range of Dutt's changing physicality -- the minutest of details are captured in his shoulders, eyes, frame, voice -- but it's the internalisation of Dutt and the intelligence to know what to highlight and where to hold back that lends candour borderlining on conceit such awe-inspiring authenticity.